A moon flying past an asteroid flying past Earth. On Monday, January 7, an asteroid 2016 AZ8 flew just 4.5 million kilometers from Earth. 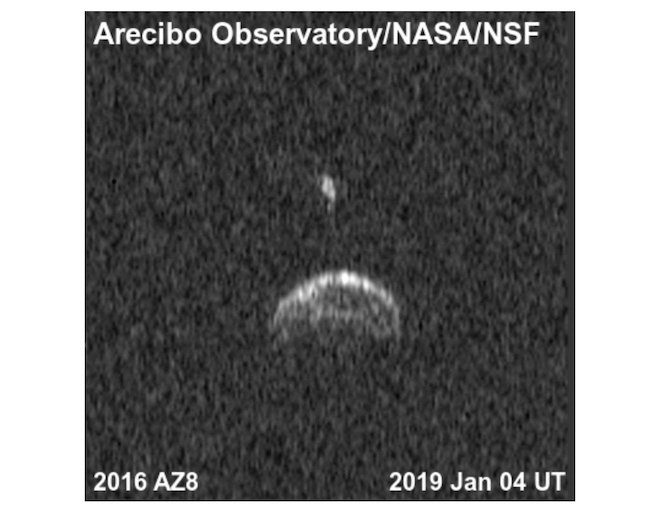 Employees at the Arecibo Astronomical Observatory in Puerto Rico recorded an approaching space stone and using radar, they discovered that AZ8 has a moon. According to the data obtained, the main element of the binary system is an almost perfect sphere with a diameter of 430 meters, and its moon has a more elongated shape, similar to a 180-meter cigar. Twin asteroids are not as rare as you might think. Studies show that about 15% of near-Earth asteroids have the moon. In the distant past, they crashed into the Earth, forming double impact craters, such as a crater in the Swedish province of Jmtland. In the future, it is possible that space agencies will have to reject or destroy a double asteroid flying toward us, so the study of their properties is important to protect the planet. Previous story How do plants adapt to cold?